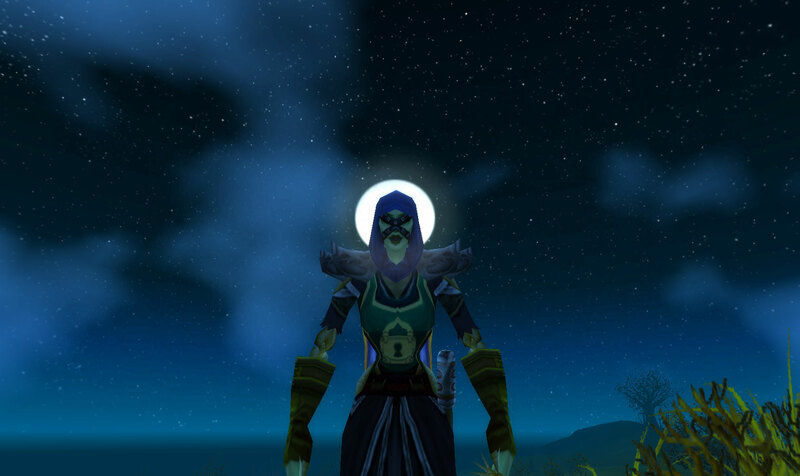 Blog Azeroth’s Shared Topic for the September 6th-12th OF LAST YEAR (which shows you how long I tend to hold onto drafts, yes?) was suggested by the blog FERALTREE. He recently wrote a post about mementos (which keep trying to spell as ‘momentos’, a word that doesn’t exist but if it did would mean ‘a small moment in time’ or ‘a chewy candy mint”). You know, those items in the bank or you bags that you keep around for the memories they bring. I had started writing a post about these things that I keep around, because I know very well what it means. You’re looking at a Class-A packrat in-game, who only gets rid of items she’s kept FOREVER only to replace them with more items that she will keep FOREVER. This screenshot is from a year ago. Her bags don't look much better today. Right now I’m up around fifteen empty slots… and I have a few bigger bags too. 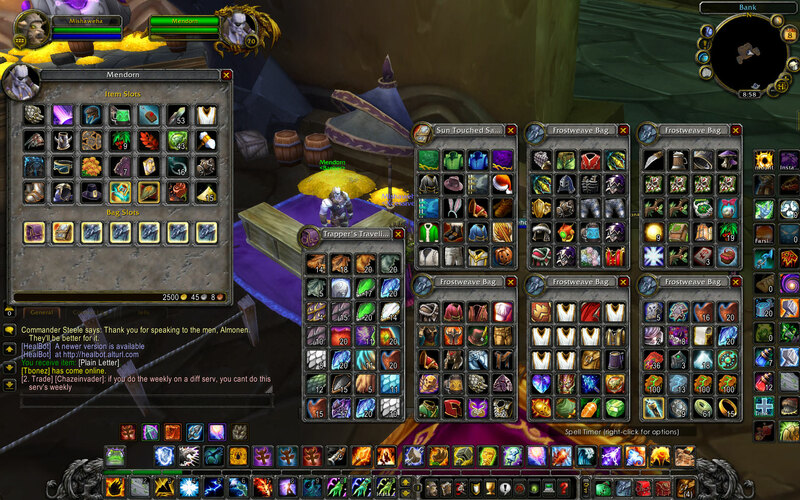 And the inventory I carry around is usually filled with items that I’m more likely to use. 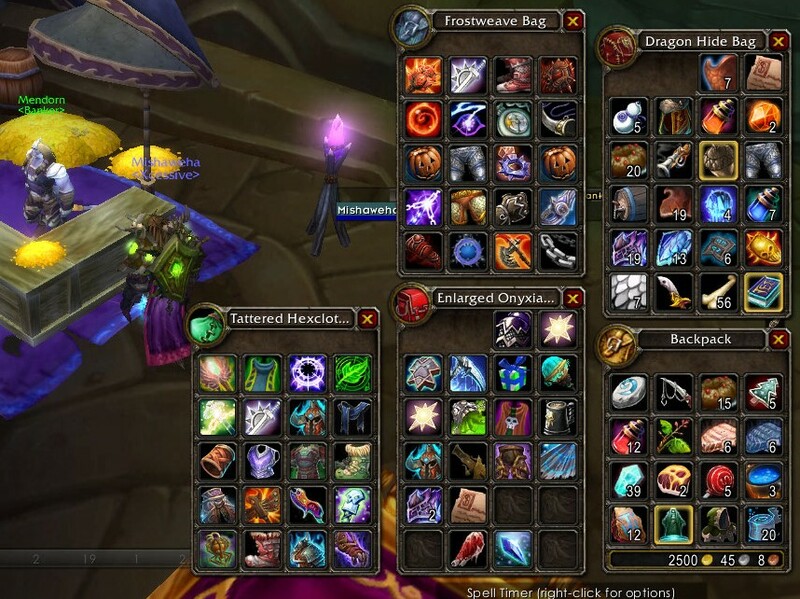 In this screenshot, for instance, the last three or so bags were full of my elemental, enhancement, and extra-resto equipment. Nowadays it has my enhancement set and some pvp gear (I use my resto set to do elemental things, which means it’s horribly optimized for pew pew). The other bags contain food, drink, potions, some more equipment, leather and other things that I skin, and a few ‘collectible’ items for fun — today’s bag is also full of these things. This screenshot from a year ago would pretty much look the same today. My bank doesn't see too much turnover. Some gear I’ve saved for looks, including my clover shield and my shiny mace (that I died many horrible, horrible deaths for). And my wolf helm. It looks awesome on Tauren. And a matching weapon set. Fury and Rage, maybe? And some old tier gear, because it looks awesome. And that scuba helmet that blasts you into the air. And the Onyxia attunement necklace, just because. 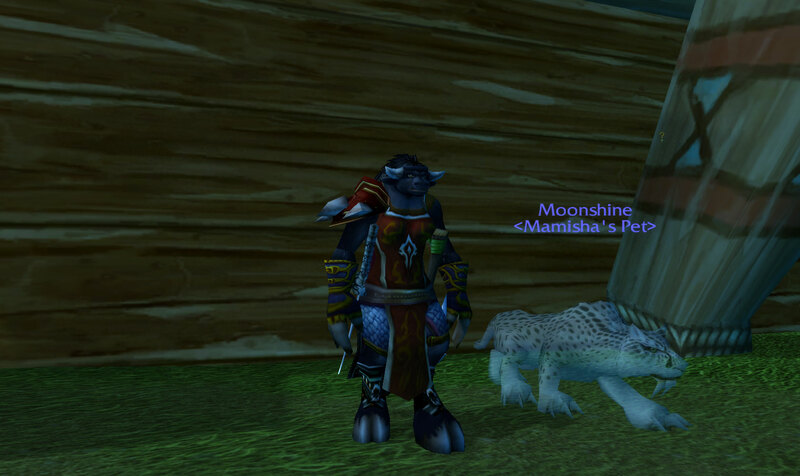 And my starting Shaman gear. That’s right, from when I first rolled Misha. A few non-wearable ‘fun’ items, like the crusader’s book thingy from the scourge invasion (or is it a trinket? ), that never-ending food leaf (why would you ever want to get rid of something that gives you free food every day?! ), some preserved holly berries, and a remote control of some sort. A bajillion tabards – I know you don’t have to hold onto them but once I buy something, I don’t want to go out and buy it again later! What if I need it NOW?! A few shirts of various colors. We have to coordinate the shirt color with our armor, you know! The voodoo trinket that summons… voodoo gnomes, I think. A shaman trinket from a shaman quest. It’s a mini-mana totem that took me awhile to replace. And then I just couldn’t part with it. AV Trinket — For the Horde! Carrot on a stiiiiiick. I was so proud of myself for getting that at level. So very proud. But now it’s useless! Essence of Eranikus. I felt really bad for him, what with the questline just sorta ending with you using his essence to empower yourself as he desperately threatens you/asks you for help. I’m holding onto it in case there’s some way to save him later, as I feel it would be wrong just to sell it. And there’s much much more! And I’m guessing here that I’m not the only one who saves their favorite old gear, and holiday outfits. How will patch 4.3 affect mementos? Another addition coming with the patch is “Void Storage”, a new 100 to 150 items slots. 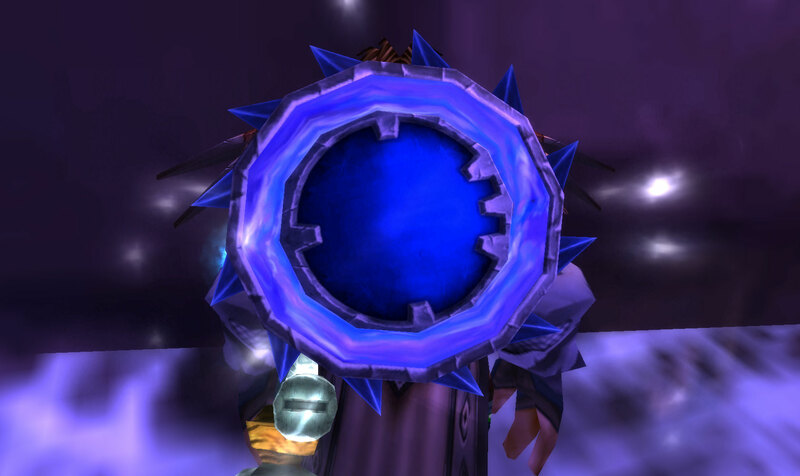 Like transmogrification, void storage comes from the Ethereals. Void storage is a pocket dimension created for a player that allows them to store extra items, but there is a downside. Anything stored in the void is stripped of its enchantments and gems and the name of the person who crafted it, Chilton said. The stripping isn’t tied to the lore of the game, either, but is the byproduct of a technical issue that makes this new storage system possible. An additional 100 – 150 slots?! For holding the gear I’ve been saving for the memories and the looks for so long? Sign me up! No longer will I and countless other pack rats be forced to give up one of their prized possessions because you want to save this new piece of gear you had. No longer will we be punished with our characters screaming “My inventory is full” just because you wanted to collect gear for three of your specs for both PvE and PvP, for your bank will now be a pristine clean space with all of your low-stat-yet-stylish treasures tucked away into the void. No longer will our fellow RPers wonder why our character always wear the same set of clothes, as our collection of RP outfits will no longer be limited by the space in our banks. (Until we collect over 100 – 150 pieces of gear, that is). (You know it will happen). I, for one, will enjoy this change immensely. Especially with transmogrification service that will be offered. What do you think? Are you looking forward to the extra bag space? Is this a change that should have been made sooner? Or do you care less because you actually have an empty bank? And is this more or less awesome than the transmogrification of armor? Let me know in the comments! 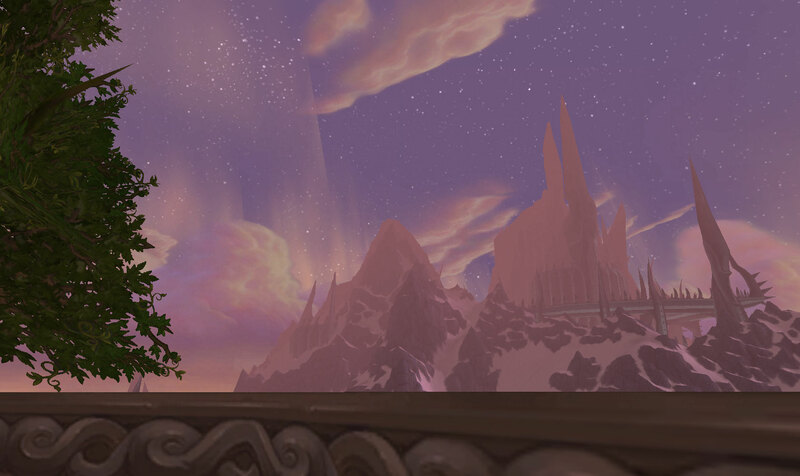 The Blog Azeroth Shared Topic for August 9-14 asks us what “mount achievements” (ala the raiding protodrakes) would Classic WoW contain if it had had those achievements (this concept was proposed in Ryyus’ post, on the blog I Gem Crit). In his post, Ryyus referred mostly to “old-school” vanilla WoW raids, as that would be where the extra rewards would come from. Unfortunately, I started playing WoW only a few months before BC, so I don’t have any level 60 raiding experience. But what I have done is run a lot of lower-level dungeons, thanks to LFD, and the fact that most of my toons are 40 and below. And since I remember these lower dungeons well (since I’ve run them repeatedly), I thought I’d make up achievements for them instead of raid instances. After all, it would be fun to get more achievements in a dungeon for stuff besides the ‘last’ boss! I used this tool to create all of these achievement images. It allows you to put in a custom image, but my laziness (and wedding planning) got the better of me, so they all have the same image. I’ll let you use your imagination as to what kind of icon would be best. Good ol’ Ragefire Chasm. I have run through this many, many times, even before the LFD system came out. In those days, most groups would actually clear the whole place to complete quests, something that very few LFD groups ever do anymore, what with the ‘final boss’ usually being the first boss most groups kill. 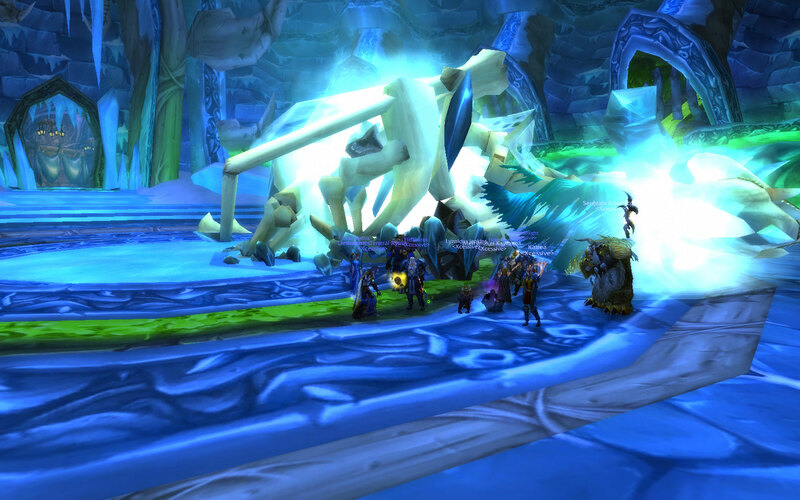 And then the drop the group, even with that perfectly good boss right over there! Yes, ‘kill the boss’ achievements, for the poor forgotten bosses of RFC. It’s a sad world (of warcraft) that we live in when one of the shortest instances in the game cannot even get a full boss clear by PuGs. It would help immensely if all dungeons had a ‘kill the boss’ achievement for each boss; at least some people would want to try to kill the other bosses then! 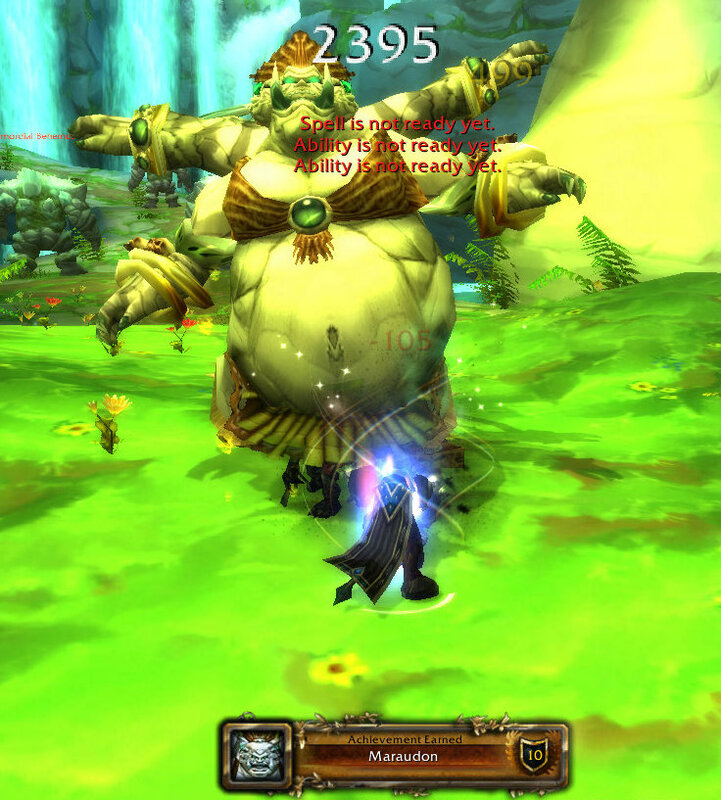 As for who these bosses are… Ogglflint is usually killed by horde players completing a quest, where they need to investigate a dead Tauren, who, presumably, Ogglflint killed. He’s up the pathway no one takes anymore, but I assume more horde LFD groups may kill him. Jergosh is the other ‘true-boss’ in the instance, besides Ogglflint and Taragaman. He drops blues and isn’t too far away from Taragaman, which makes it extra frustrating when people drop group as soon as they get their bag. 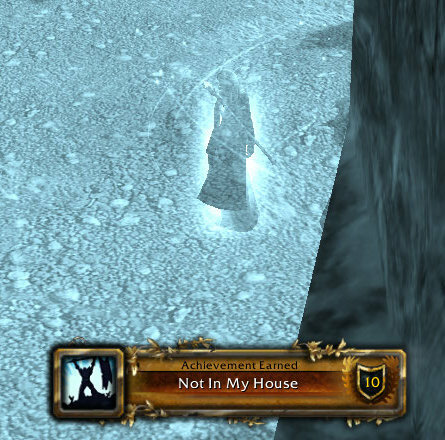 Bazzalan isn’t technically a boss, but he is the object of a quest for horde players, so it would be nice to get an achievement letting everyone know you killed him. Also, I totally vote for him to become a boss who drops nice things. That quest line always annoyed me, as I got lost in the cave. I died in there a lot. But I think I’ve completed it on several of my horde characters, and I think it’s a worthwhile experience, especially if you do it at level. I think this is a fun one. Usually groups I’ve been in will pull the rock elemental room recklessly, so why not make it an achievement? The numbers could be tweaked to make it more completable by at-level characters – I’m unsure how many elementals could be killed at once with the limited aoe at 15, so maybe 10 is too many. Groups often always get the patrols in the center area to add at the most inopportune times. Why not give an achievement for getting them all? This is one of the longest early dungeons. The sprawling zone requires you to pretty much kill everyone and everything on your way to the final boss, Mutanus. For those of you scratching your head at the name, that’s the murloc at the end of the instance. You know, the one you summon after you kill all the bosses*. Before LFD, I had only done a full run of WC twice before, and those were when I outleveled the place! So yes, it’s pretty tough for a random dungeon. Alternate title for “The Eastern Gulph”: Leap of Faith. When you go down the ‘left side’ (when coming from the entrance, facing the end cave. It may not actually be east on the map, but I equate ‘left’ with ‘east’ apparently), along that path is a gap. You must jump across this gap. If you just walk off, you will fall down, and it will take forever to get back up. Trust me. Therefore, it makes sense you to get an achievement for making the jump — it reinforces your behavior there, plus it’s existence tips you off that there is, in fact, a gap there. As for the gully, well, it’s the fastest way down when you’re done with that side. Why not add an achievement for it? Okay, okay, maybe the second one isn’t actually related to any events. But at least you’ll know there is someone named Naralex who’s sleeping, right? The first one encourages people to get the buff from the Tauren. You wouldn’t believe the number of people in LFD groups that don’t talk to him to get it. Yup, that mechanic is sleep. Being put to sleep three times would be easy, based on my experiences. But staying awake while fighting the Fanglords? Much more tricky! You’d have to, like, interrupt stuff or something! *Technically, you only need to kill the four Serpent Lords. However, on your way to all the Serpent Lords, you have to kill the majority of all the mobs on the way, and all the extra bosses are either on your way there or back, so it makes sense to kill them instead of skip them when they’re ten feet away or blocking your path. 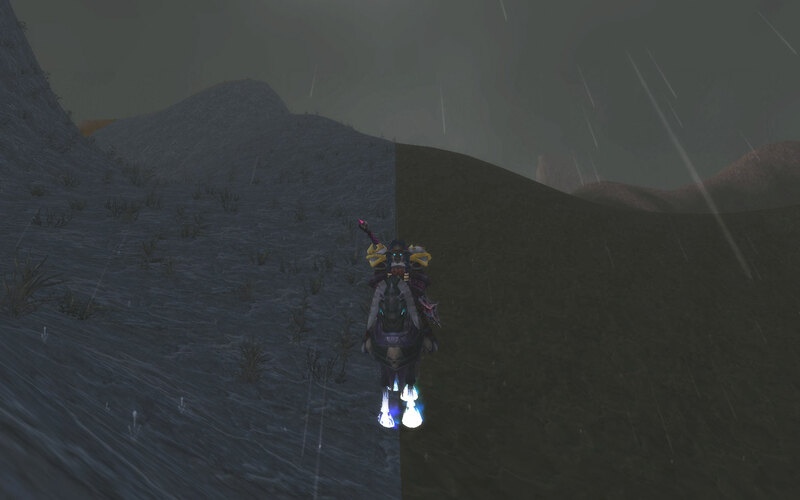 Deadmines is another long instance, though not as long as Wailing Caverns, I think. Either way, I couldn’t think of too many achievements. The ones I do have are based more on various events in the mines. The Tauren in me is cringing, yet it still makes me giggle. Plus it encourages toons to learn cooking! This one could use some tweaking, I’m sure, but that water wheel has saved many a group (usually not me, because I never remember about it until too late). This is key for rezzers, as you can save the group a run back if you hop on during an inevitable wipe. BWHAHAHAHA. I’d like to see anyone do THAT at level. I’ve killed all but the Crowd Pummeler 9-60 and the Dark Iron Ambassador (who I have seen once, since he’s a rare spawn). An achievement like this would encourage LFD group to kill more than just Viscous Fallout, Electrocutioner 6000 (sometimes), and Thermaplugg — a fairly small number of bosses for such a large instance. What achievements would you add? Are there any achievements you would add to these instances? How about other instances and old end-game raids? 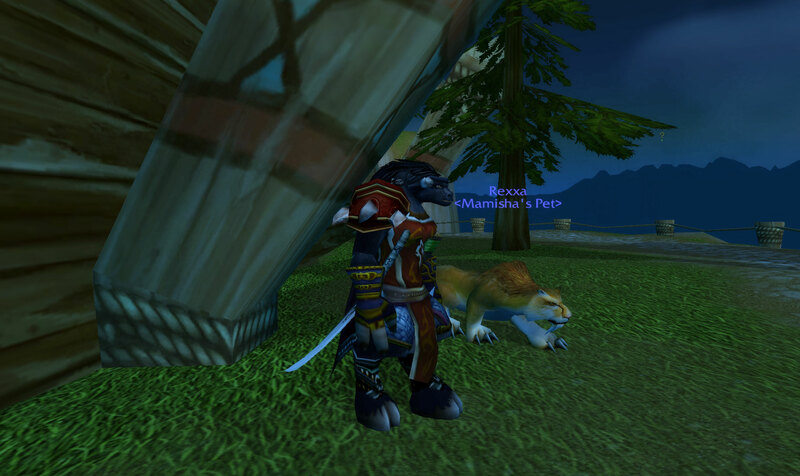 Today’s post is a Blog Azeroth Shared Topic for July 26-31. Nuniel, from the very art-filled and aptly-named blog “The Rambling Draenei Death Knight”, asked us to share a screenshot, fan art, or handmade drawing, and then tell us about it and how it makes us feel. Since I love art and pictures, I’m going to do, not one, but TWO posts on this subject — with multiple pictures in each post! (That’s allowed, right? I could hardly pick just one image to talk about — I couldn’t make up my mind! Which reminds me – this is an image heavy post!) Later this week there will be a post focusing on user-made art, but today’s post will be about screenshots. Screenshots. Lots of people take them. I know I do; I’ve even ‘graduated’ from manually taking most of them to letting the addon Achievement Screenshotter take pictures for me. And let me tell you, there are a lot of reasons I take screenshots. The majority of them nowadays come from Achievement Screenshotter. So obviously, I get a lot of screenshots of my achievements (which include my usually messy UI!) It was fun to flip through and see all the ones I have gotten in the past. It only took her until level 80 to get this achievement! Poor DKs. 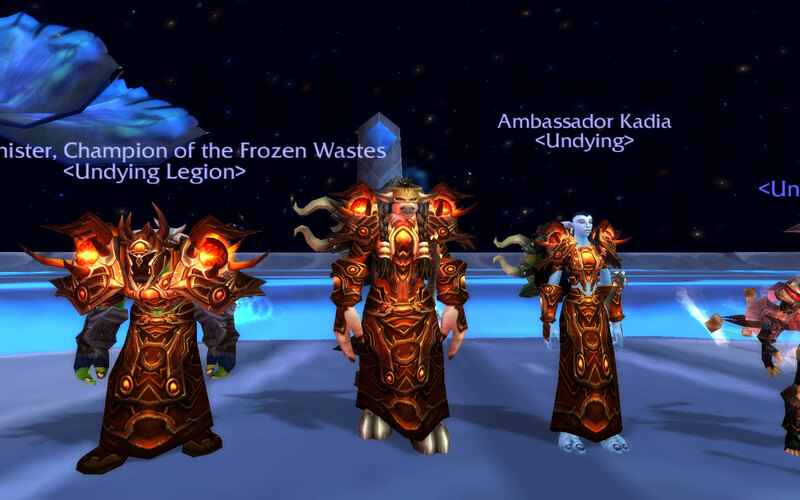 Getting achievements while dead in BGs is more common than you'd think. Achievement Screenshotter also conveniently takes pictures when you ding! In addition to both the ‘dings’ and the achievements, Achievement Screenshotter can also grab the battleground info. I eventually turned that off, because I participate in quite a few battlegrounds where I lose horribly the score is uninteresting, so I figure I can save the space on my computer for screenshots that don’t show such crushing disappointment aren’t so boring. 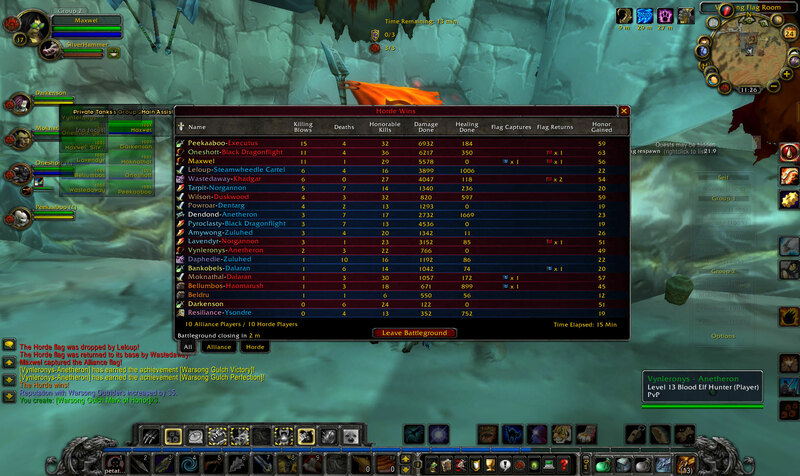 But here's one that's interesting, since the Horde won. Check it - I even capped the flag to win. Hooray! 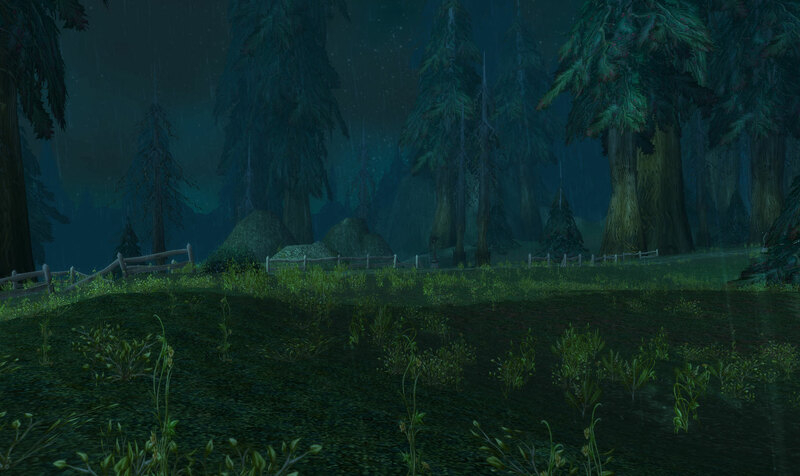 But not all of the screenshots I have are taken with the addon. I do still use the good ol’ fashioned ‘print screen’ key to take them. And after going through just one of my screenshot folders (the one on my main computer — I’m leaving the other computers out of this post), it’s occurred to me that I take screenshots of a lot of random stuff. You've probably seen this before, but it still makes me giggle. I have used a quiz addon to keep some of our raids occupied during downtime. Please note which player gave the correct answer first, and that Lightness, bless his heart, is a paladin. Quizzes are so much fun! Of course, there are other reasons we took group shots. Like after we took out the Alliance Leaders — FOR THE HORDE!!! 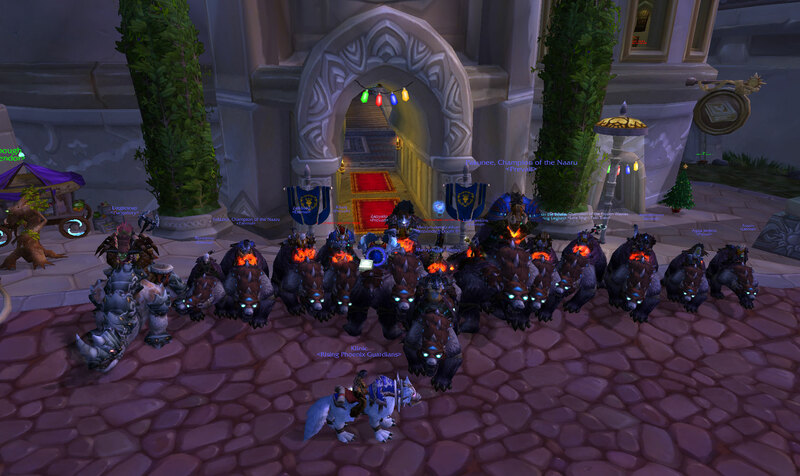 After trouncing of the Alliance cities, we obviously we had to go pose on our bears in front of their inn, right? This particular bear run was set up by Dreykala. She set up weekly runs for months (maybe even more frequent than that), with an almost 100% success rate. And if they did fail on one, she always made sure to follow up so everyone could get a bear. It got to the point that people wouldn’t go on a For The Horde run unless she was leading it. And then she would sing a song in vent after the raid. It was pretty cool, even if you had to stay up ridiculously late. 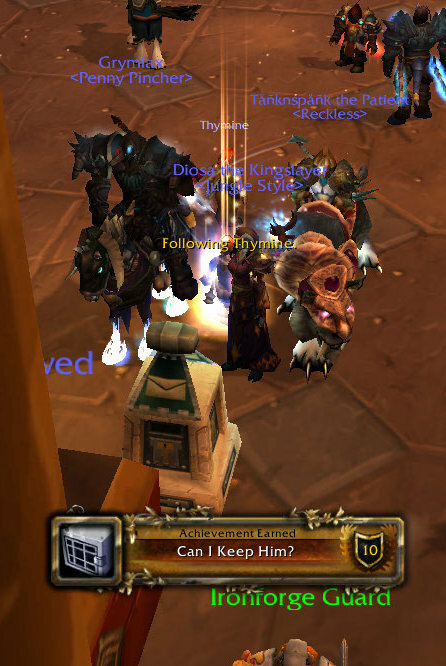 Eventually, server trade chat troll Hemoomoo raised gold (through trade chat and word of mouth) to buy Dreykala a motorcycle. That was pretty cool. Love is in the air! 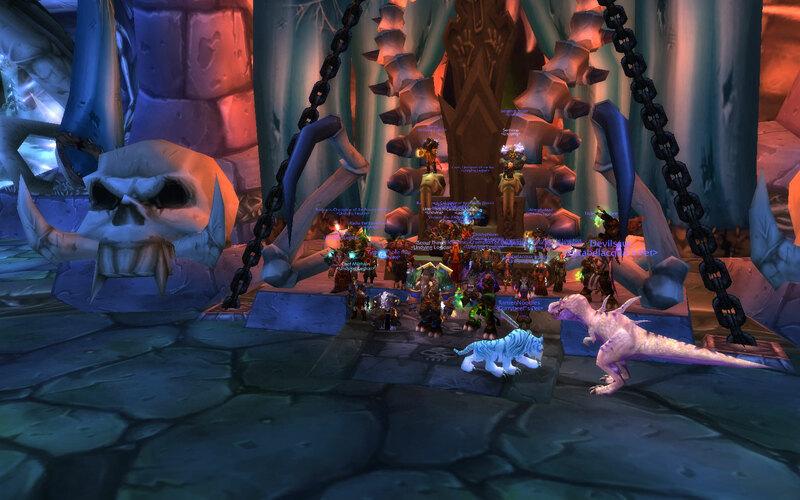 Horde and Alliance (and Undead Ghouls) all sitting together and having a good time. "I stand on the divide between good... and evil. Or something like that." I love that shield. I think I still have it. OH NO! I'M GREEN! 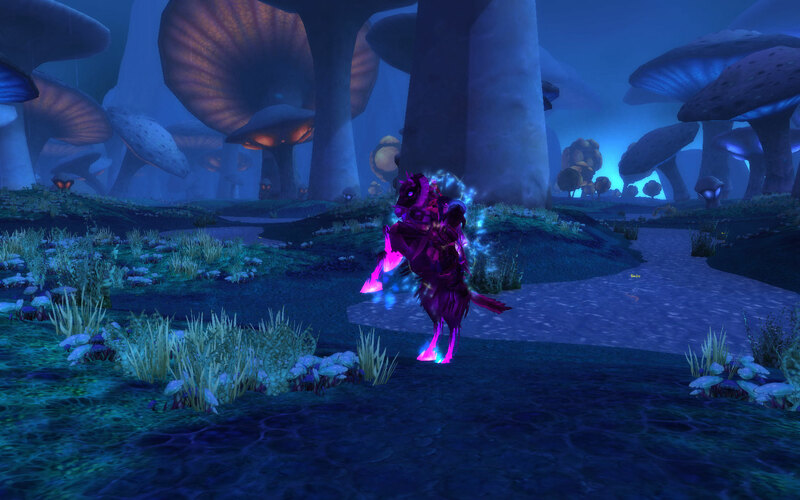 Also for some reason my horse turned green too... check out those glowing hooves! Pink now!? Enough with the color-changing already! Can YOU find the Tauren in this picture? 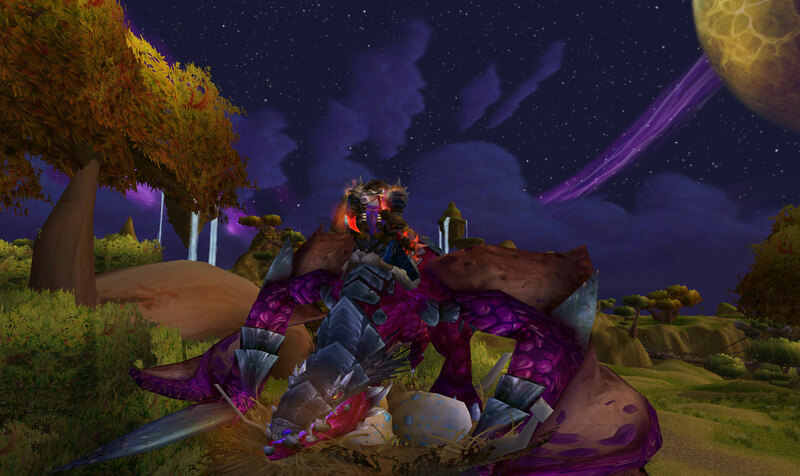 And I also take lots of pictures of my mounts, especially ones where I’m flying around. 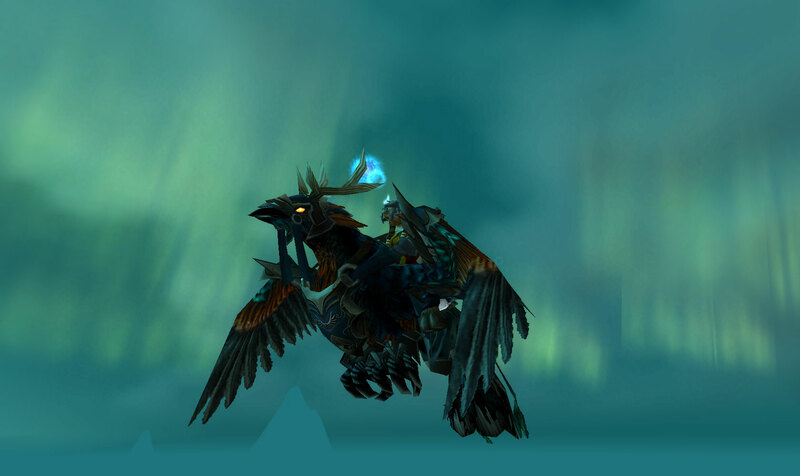 My very own Cenarion War Hippogryph. Oh, I'm not doing much. Just guarding these eggs here. But my favorite type of screenshots, out of all the ones I’ve shown from my extensive collection, are the ones that take the character out of the picture, and just admire the scenery. 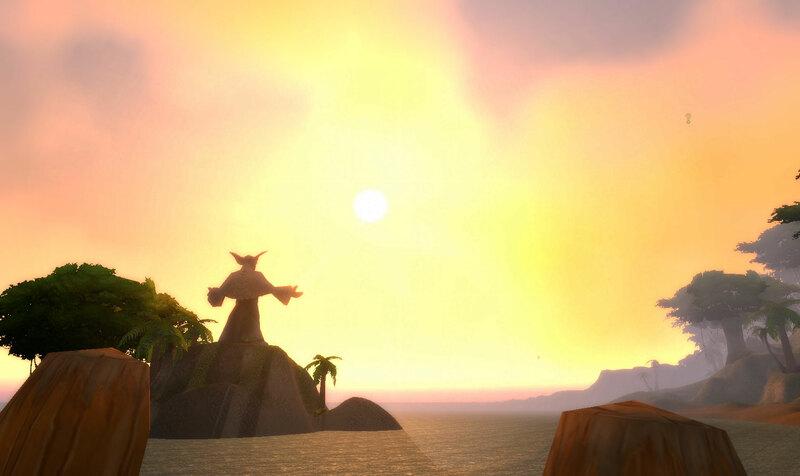 The World of Warcraft can be a beautiful place. But these are only my favorite types of screenshots. Do you have a favorite type of screenshot? Do you take lots of screenshots, or only when you think it’s a ‘special’ moment? Let me know! 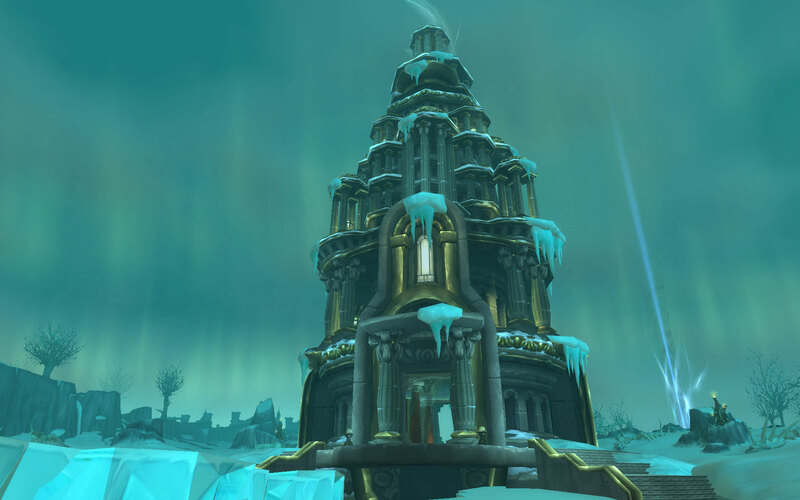 Today’s post is a Blog Azeroth Shared Topic for July 19-24, proposed by Strumwulf. 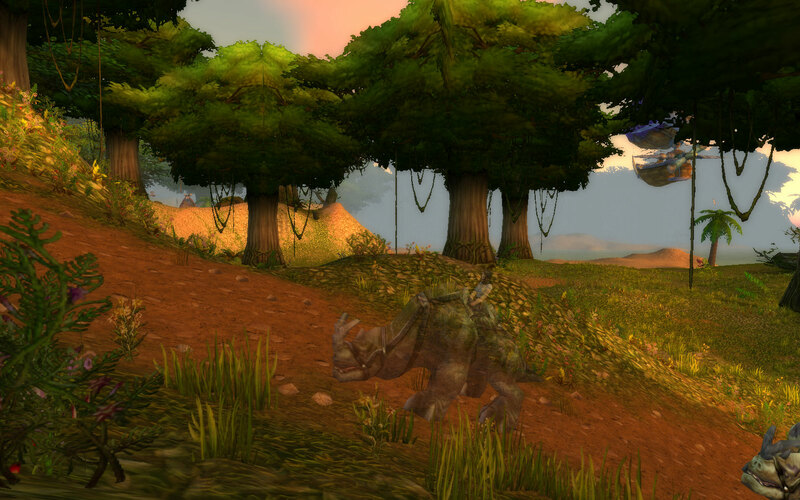 We are asked to RP a scene with our favorite mount (you can see Strumwulf’s RP scene here). Now, I may not have a favorite mount (I love them all! Well, actually, I love most of them), but the one that I have the best backstory for is the Red Drake, from the Red Dragonflight. I made sure to get my Wyrmrest Accord rep up first when I got to 80, and saved up my gold to buy the drake as soon as I was exalted, so he holds a special place in my collection (even though I spend most of my time nowadays on the extra-fast Violet Protodrake and Sparkle Pony). And now, for your enjoyment, is the short tale of the ‘Flying Ace. “Dive!” Mishaweha yelled, and then hung on for dear life. The red dragon (well, drake, really) she rode upon furled his wings and plummeted towards the distant ground, weaving between other drakes and dragons of the red and blue flights. Above them, the magic flames of their attacker — a blue dragon — ceased, as he realized his target was now well below him. He too dove through the battlefield. “Turn and fire?” Daestrasz spoke to Mishaweha. Of course, he didn’t actually say anything. Dragons were like that — all they needed to do was make you think you heard them speak. It was usually best not to wonder how that worked and just accept the fact that dragons were fairly magical beings. Daestrasz’s wings shot out, catching the air in a well-practiced maneuver that Misha was now well-practiced at not falling off him when he did it. So experienced she was that it only took a few seconds to straighten up and sight their enemy. Daestrasz swiveled to the approximate degrees she shouted, mouth already churning with fire. With a might breath (or belch, as some would say), the fireball roared at the approaching blue dragon. The red drake’s flames hit the blue’s right wing and side, searing the scaly skin and burning a large hole through the wing. Their enemy roared in pain as it plummeted to its death. “Got him!” Daestrasz said, sounding proud. He had taken down full grown dragons before, with Misha’s assistance, but it was still impressive for a mere drake to do. “Who do we take on now?” he asked. Misha surveyed the battlefield. Fights were dying down, and the majority of the blue flight was either retreating or locked in mortal combat. “I suppose…” He turned and gracefully flew back to the Temple, taking her to the checkpoint. Landing a little awkwardly in the smaller space, he walked away from the ‘narrow’ entryway to let other drakes through. He crouched down, to allow Misha to slide off. As she shook her stiff legs, Daestrasz brought his head down to be level with hers, tilting it to the side to get a good look at the tauren. “I like you, Misha,” Daestrasz stated matter-of-factly. “Oh – … I like you too, Daestrasz,” Misha replied, a little surprised. Usually he paid her little mind once they were done on the battlefield. “Ah. Mishaweha. Thank you for your assistance today. It is very much appreciated,” he said with a small smile, handing her a few gold. She turned to leave, but was interrupted mid-step by Afrasastrasz. “Tariolstrasz will see you up.” He gestured in the steward’s direction, and then went back to his reports. Misha switched directions and went to Tariolstrasz. He gave her a curt nod before fetching a nearby drake to whisk her up to the top of the tower. She recalled the first time she was allowed to go visit the Queen… it was… amazing yet terrifying. She had been near petrified, being so close to such a powerful being (you could feel her aura hum in the nearby air), yet she was so kind as Misha gave the message from her delegation (she had pulled the short straw; the others apparently did not want to be the tongue-tied one up front). But today she would not have to present herself to the Queen (a reluctant relief). Instead, once her ride dropped her off, she went off to Cielstrasza, the quartermaster for the mortal allies of the Wyrmrest Accord. “I heard you wished to speak with me, m’Lady?” Mishaweha asked after giving Cielstrasza a salute. Misha nodded, not too sure where this was going. Misha blinked, surprised yet again. “Well, yes! That would be… very exciting. But…” She trailed off, afraid to question such good news. Misha nodded. 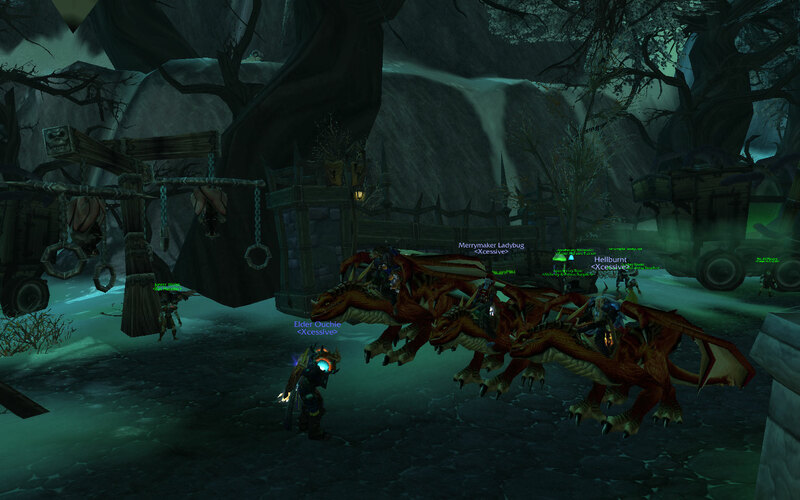 She had heard a similar spiel before, when she first started riding drakes into the Wyrmrest Temple battle. Cielstrasza grinned. “Excellent. Let me get you set up.” She turned and rummaged in a nearby box, where there was a set of thin leather rings. Cielstrasza picked one out and eyed it for size. “This will do…” she murmured, and then her eyes glowed brightly as she muttered an incantation. Magic jumped from her fingers onto the loop, which shimmered for a moment with red light before the dragon turned to give Mishaweha the loop, apparently satisfied with her work. Misha took the leather loop. It tingled slightly. “Excellent. Also, since we want him to stay out of harms way, please do not ask him to fight for you. We do not wish for any of your enemies to become angry at our Flight or the Accord, as we have our own worries. … Oh yes – the Accord also requests a donation to the cause for allowing you the opportunity to fly on our wings.” Cielstrasza’s last statement sounded rather wooden, as if she was reading from a script. Inwardly, Mishaweha shrugged. The quartermaster often asked to exchange gold for services. “For you? 1800 gold.” Cielstrasza smiled sweetly. Misha blanched, but nevertheless fumbled for her money pouch and emptied its contents into Cielstrasza’s waiting box. The dragon peered at the amount given. “Yes, m’Lady, we will!” Mishaweha bowed deeply and was about to turn away when Cielstrasza grabbed her shoulders, pulling Misha’s head close to hers. “I understand. I will,” Misha responded softly, looking down at the concerned blood elf face. The concern softened slightly at her words. For a moment longer they stayed like that, the tauren held fast in Cielstrasza’s deceptively strong grip, before the dragon let her go. Mishaweha bowed once again, and left quickly, in search of her new mount, partner, and friend.